Tucked at the foot of the Slavkovsky Forest, the Hubertus Hotel Marianske Lazne is a scenic option for travelers to this remarkable area. It is only a few minutes from the heart of the city which is the home of the Spa Colonnade, Caroline's Spring and the many other springs that dot the landscape. 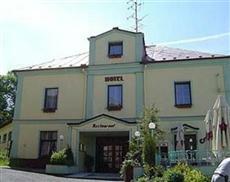 The Hubertus Hotel Marianske Lazne is located at Namesti Republiky 131 and is 23 miles from the Karlovy Vary International Airport. All of the bedrooms in the Hubertus Hotel Marianske Lazne are outfitted with a large private bathroom, satellite TV, a minibar, direct dial phone service, high-speed Internet access, and room service. Visitors to the Hubertus Hotel Marianske Lazne will be able to rely on the many amenities which include, free parking on the premises, an in-house restaurant, pet friendly policies, a garden and terrace, free daily breakfast service, tennis courts, a modern fitness room, golf course access, a spa with massage and beauty treatments, meeting and conference rooms, a business service center, and a tour desk.